KUALA LUMPUR, Malaysia (AP) -- Experts have confirmed that the debris found on Reunion Island last week was that of Malaysia Airlines flight 370 that went missing last year, Malaysia's prime minister said Wednesday. 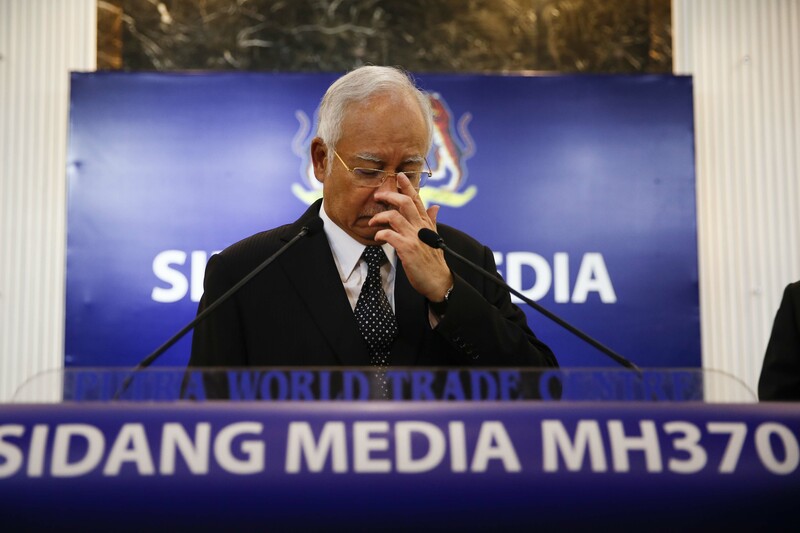 "It is with a very heavy heart that I must tell you that an international team of experts has conclusively confirmed that the aircraft debris ... is indeed MH370," Prime Minister Najib Razak told reporters. The Boeing 777 jetliner disappeared 515 days ago on March 8 while on a flight from Kuala Lumpur to Beijing with 239 people on board. It is believed to have crashed in the Indian Ocean, but the reason remains one of aviation's biggest mysteries. "We now have physical evidence that, as I announced on 24th March last year, flight MH370 tragically ended in the southern Indian Ocean," Najib said. "The burden and uncertainty faced by the families during this time has been unspeakable. It is my hope that this confirmation, however tragic and painful, will at least bring certainty to the families and loved ones of the 239 people onboard MH370. They have our deepest sympathy and prayers," he said. In a statement, Malaysia Airlines said the part of the plane's wing, known as a "flaperon," which was found on Reunion Island on July 29 had been confirmed to be of Flight 370. "Family members of passengers and crew have already been informed and we extend our deepest sympathies to those affected," it said. The statement said this "is indeed a major breakthrough for us in resolving the disappearance of MH370. We expect and hope that there would be more objects to be found which would be able to help resolve this mystery." At a press conference in Paris, authorities were much more cautious than the Malaysian prime minister. Deputy French Prosecutor Serge Mackowiak didn't outright confirm that the debris belonged to flight MH370 but said there were strong indications that it was the case. "The very strong conjectures are to be confirmed by complimentary analysis that will begin tomorrow morning," Mackowiak said. "The experts are conducting their work as fast as they can in order to give complete and reliable information as quickly as possible." Jacquita Gomes, the wife of crew member Patrick Gomes, said she was informed by Malaysia Airlines about the news half an hour before Najib's announcement. "Now that they have confirmed it as MH370, I know my husband is no longer of this world but they just can't leave it with this one flaperon. We urge them to continue searching until they find the plane and bring it back," she said. "We still need to know what happened. They still need to find the plane. They still need to find the black box to get the truth out," she said. "It brings some sort of closure but not a complete closure. We don't know what happened and where the plane went down. It's not over yet." Gomes said she hopes to get her husband's body back so that the family can give him a proper burial and say goodbye. "My son doesn't know yet that his dad is really gone, that he won't be back," she said, in tears. "I will have to tell him tomorrow before he goes to school." Highly technical efforts to extrapolate the jet's final hours before it would have run out of fuel gave force to the theory that it went down somewhere in the southern Indian Ocean. Analysts have said a close look at the wing part could indicate what kind of stress the plane was under as it made impact. It won't fully solve the mystery of why the plane disappeared, nor will it help pinpoint where the plane crashed. Malaysian officials, who are leading the investigation into the plane's disappearance, have said the plane's movements were consistent with deliberate actions by someone on the plane, suggesting someone in the cockpit intentionally flew the aircraft off-course. Another theory is that the jet plunged into the water vertically - high dive-style - snapping off both wings but preserving the fuselage. Yet another possibility, supported by a flight simulator, is that an out-of-fuel Boeing 777 would belly-flop heavily tail-first, disintegrating on impact. Paul Joshua in Kuala Lumpur and Thomas Adamson in Paris contributed to this report.